Last week I was lucky enough to swing a couple of days in Vancouver on my way back to Pittsburgh from Australia. I didn’t need a lot of persuading to stop by the seaport city; I always enjoy my time there, whether spent on the beach, at one of the many great museums, or at the delicious Toshi’s Sushi. But the reason for my visit this time was to catch the exhibition AKOS: Corey Bulpitt, curated by Kwiaahwah Jones at the Bill Reid Gallery. I was really glad I did, because it is a knockout show. It is always exciting to see an artist emerging into an important new talent. AKOS shows Bulpitt restlessly but methodically working through a range of critical questions, and finding a pretty striking array of answers. I am still processing my thoughts on the show, and on Bulpitt’s work in general, so that is something for a later, longer piece. For now, I just wanted to encourage you all to try and catch AKOS: Corey Bulpitt before it closes on September 14. I have blogged on Bulpitt’s work before, and am currently working up a longer piece. Up until now, my interest has been mostly in his mural practice, and how this works both within and across cultures in interesting ways. But what AKOS: Corey Bulpitt shows is just how reflexively Bulpitt is engaging with the historical trajectory of these traditions. 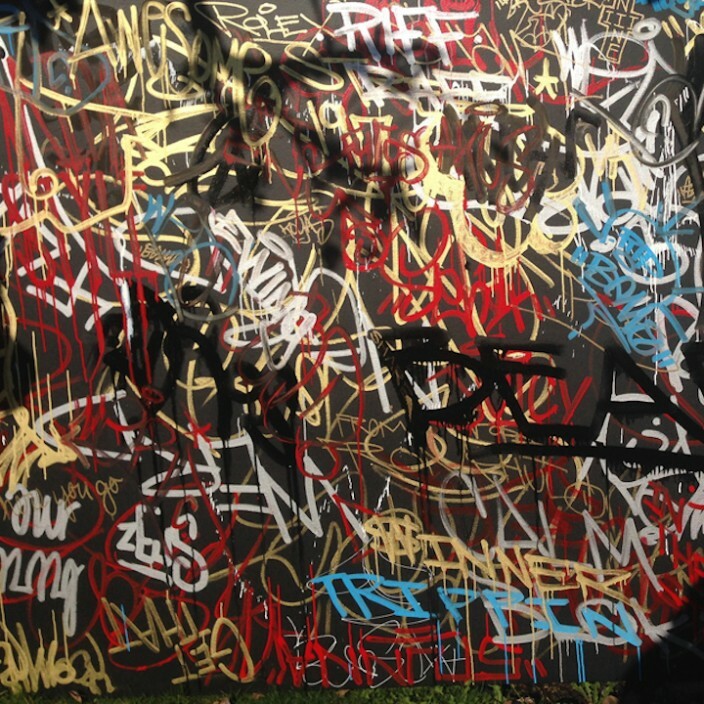 Take for instance the work Old School/New School 2014, which is one of the first “graffiti” style works in the exhibition. The title refers to a multi-faceted pun taking place across the canvas. On a black background, Bulpitt has stenciled a “school” of salmon in the traditional formline style. While formline is clearly an “old school,” the use of stencils belongs to a “new school” of graffiti practice (made famous by the work of Banksy, but which also has a lineage stretching back several decades.) On top of this, Bulpitt has created a crashing wave of free-hand aerosol paint lines, redolent of the classical style of “old school” graffiti practice. But like all of Bulpitt’s work, this combination of styles comes together into something seamlessly whole: itself a “new school” of Indigenous artistic practice, embodied by collective movements like Beat Nation and the Vancouver based Shop Wrong, of whom Bulpitt is an active and prominent figure. This is a lot going on in just a single work, but the exhibition teases out the implications in even more profound ways, in large part due to the sophisticated curating of Kwiaahwah Jones. Jones has skillfully managed to unite the disparate parts of Bulpitt’s practice (from traditional totem poles, ceremonial masks, photography and painting) into a seamless whole. This is no mean feat in the complicated spaces of the Bill Reid Gallery, in which the work of the museum’s namesake casts a long shadow. However, Bulpitt and Reid actually share many similarities: both discovered their Haida artistic heritage later in life; both viewed their predecessors with great reverence, but both were determined to be cultural innovators. Thus, while works like Pipe Dreams/Tunnel Vision should seem jarring set amidst Reid’s beautifully austere forms, they work in tandem to present both the persistence and dynamism of Haida culture. 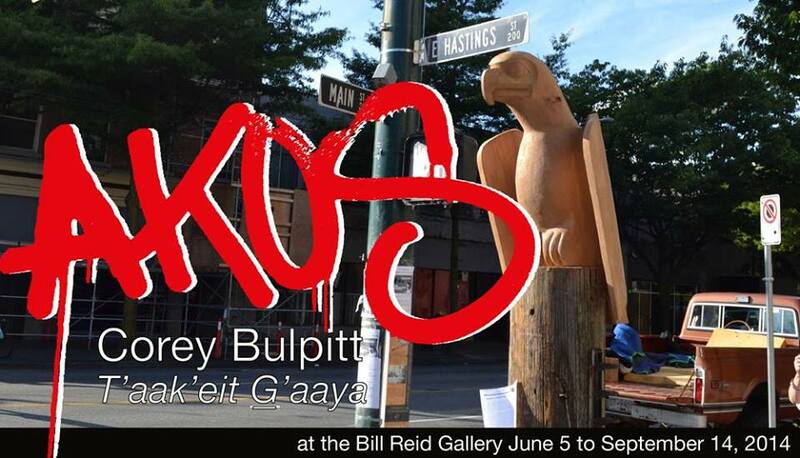 AKOS: Corey Bulpitt is on at the Bill Reid Gallery, 639 Hornby Street, Vancouver, BC until September 14.